30 Second Wine Advisor: Bubbly trivia: Plaques! Get a $25 Wine Credit for YOU! It's Black Friday again. Give a wine club gift from The California Wine Club today and we'll give you a $25 wine credit to spend any way you wish. Use promo code CREDITME when ordering to secure your credit. More details below! Send a Gift: Get a Credit for YOU! Planning to pop the cork on a bottle of bubbly or two over the holidays, or on New Year's Eve? Thinking about Champagne, and all the world's other sparkling wines, reminded me about two of my favorite truly obscure wine words related to a truly obscure wine hobby: "Muselage," or "muzzle," the witty French name for the wire cage that securely holds a Champagne cork in place; and "plaque" (or "plaque de muselet") for the small, dome-shaped, often colorfully decorated metal cap that protects the outer end of the cork. I doubt that there's any practical re-use for the muselet, which ends up pretty badly twisted after you take it off. But the plaques de muselet? That's a whole 'nother story. I was intrigued to learn, quite a few years ago, that lots of wine enthusiasts - particularly French wine enthusiasts - collect them and even build fancy display cases to show them off. Enameled and shiny, they are often brightly colored. Many carry the wine producer's trademark or logo. Right after I wrote a column about this in 2001, I started saving plaques de muselet myself. I never did get around to displaying them, but I have a large coffee mug full. When I wrote about plaques back then, I was deeply indebted to an online source, John Holland's ChampagneMagic, an all-about-bubbly publication that was perhaps the only English-language source of placomusophilia on the Internet. Alas, it's gone now, so I guess it's up to me, in debt to Mr. Holland, to keep the basics available for The Google - and all of you. Early Champagne bottles, Holland said, were stoppered with wood and sealing wax. Corks tied down with string (as you'll still see now and then with artisanal Lambrusco) persisted well into the 1800s before a Frenchman named Adolphe Jacquesson patented the wire cage and metal capsule in 1844. It was not until the early 20th century that Champagne makers started putting slogans and trademarks on the small metal disk, turning a functional item into a potential collectible. How about you? Do you collect plaques de muselage? Have you ever noticed them? 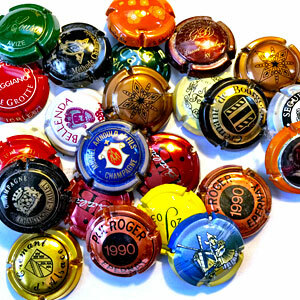 If you enjoy bubbly now and then, this may be your opportunity to start a new hobby! If you like a little controversy with your wine, I think you'll enjoy Benjamin Wallace's book, The Billionaire's Vinegar, The Mystery of the World's Most Expensive Bottle of Wine." An investigative story, yet a good read, it takes a close look over the controversy surrounding an 18th century bottle of Chateau Haut-Brion with the initials "Th. J" engraved on the bottle. Based on its rarity and its purported connection with Thomas Jefferson, Christie's auction house in London sold it at auction in 1985 for a cool $156,000, even though many considered its authentification dubious. Was it a fake? Was it real? A suspected scammer insisted that it was genuine, even after investigators found empty bottles, blank wine bottles and ancient corks in his home. The alleged miscreant moved to Europe, beyond the reach of U.S. law, and the issue remains uncertain. Wallace digs into all this, and much more about the dark, little-known world of fine-wine counterfeiting, in The Billionaire's Vinegar. Interested in reading it over the holidays? Amazon.com no longer has new copies, but you can order it online in hardcover or paperback from secondary sellers by clicking this Amazon.com link. Or, you can start reading it immediately on your Kindle or free Kindle app. Click here to download the Kindle edition for $9.99 now. As always, Amazon.com purchases made through these links will return a small commission to help us pay the bills at WineLoversPage.com and The 30 Second Wine Advisor, and we're always grateful for that! It's Black Friday again. Give a wine club gift from The California Wine Club today and we'll give you a $25 wine credit to spend any way you wish. Use promo code CREDITME when ordering to secure your credit. A minimum 2-month gift purchase is required to qualify for this offer. Coupon code for $25 credit will sent by email on 12/20/2014. One credit will be sent per gift giver. Offer cannot be combined with any other promotion or discount nor applied to previously placed orders. Offer ends at 11:59 p.m. PST today, Dec. 12, 2014. Send a Gift and Get a Credit for YOU! FOOD MATCH: A natural with red meat from roasts and steaks to burgers, it would also go well with cheese dishes or even game and organ meats. It was fine with a simple dish of conchiglie pasta with grilled sausages, garlic and butter. WHEN TO DRINK: Dolcetto is not considered an ager, but I have to say that this 2009 bottle, four years behind the current vintage, is holding up very well. It may be showing more tannin with the passage of a few years, but that's not a problem in this wine, particularly when served with appropriate food. VALUE: I got a good buy on this older bottle at $15, but I'd be delighted to pay an upper-teens price for a recent vintage. Wine-Searcher.com reports an average $17 U.S. retail price for all available vintages. This seems to be the producer's English fact sheet on this wine, although it refers to it by a slightly different name. The details match, though, including the source vineyard, Madonna di Como. Locate vendors and compare prices for Madonna di Como Dolcetto d'Alba on Wine-Searcher.com.